I. Love. Caprese. Salad – but making it for a crowd can be a bit of a pain – and expensive if you want really good tomatoes & mozzarella. 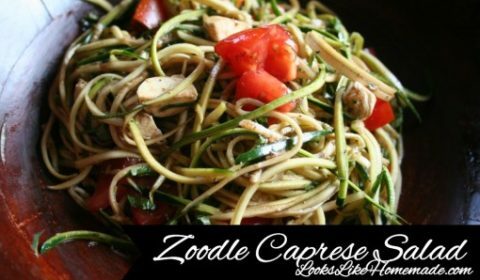 This salad combines a new technique – zoodles – with a classic salad. I don’t have a spiralizer, so I use a julienne peeler on the zucchini – which makes nice matchstick strips. I buy the small balls of mozzarella, and cut them into quarters or eighths – but you can buy pearls of mozzarella that are small and work well too. I can’t always get them here so I improvise. It went against the grain the first time I made this to eat zucchini raw – but honestly it’s really good – and holds up well to a bit of dressing. So easy, so tasty, and a great way to use up the mounds of zucchini your garden will produce this summer! 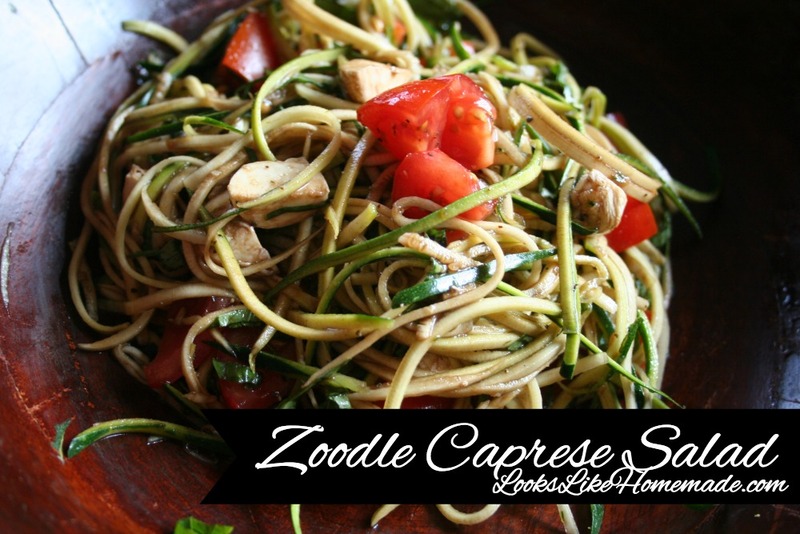 Use a julienne peeler or a spiralizer to cut your zucchini into "noodles" into a salad bowl. I leave the skins on and wash the zucchini off well.